I could not be happier than this thank you thank you DEJE SELAM.Indeed peace is starting to restore. egziabher yimesigen... I wish the way dejeselam presents the news could have had a different tone..... it sounded as always..... as if HH is not cooperating at all..... as if he has no potential of correcting his faults unless forced etc.... this approach sounds familiar... hmmm.. not spiritually constructive though.. If this decision stands, one down for EOC. ደጀ ሰላሞች የምን መርዶ ነው የምታሰሙን? አምስት መቶ ዓመታት ሳይፈርስ ይቆያል የተባለለትን የቅዱስነታቸውን ሐውልት ሊያፈርሱብን ነው? ባይሆን አምስት ወር እንኳን ይሙላው እንጂ !!!! ቂቂቂቂቀ….ደግሞስ ወይዘሮዋ ጳጳስ ሁለተኛ ወደ ቅፅረ ቤተክህነት እንዳትገባ መከልከል ምን የሚሉት ነው? አንዳንዶች እርሷን ፍለጋ እንዲንከራተቱ ነው ወይስ መንበረ ጵጵስናውን ወደ እርሷቤት ለማዛወር? እስኪ እድሜ ከጨመረልን ገና ብዙ እንሰማለን ! ምእመናን ሆይ፣ እባካችሁ በርትተን እንጸልይ. O! our Loard I thank you what did with our spritual fathers. Our Lady Holy Virgin Mary please helps our fathers to make the right decision for our mother churches. አዲስ አበባ ሃገረ ስብከት ደሞ ለማፍረሻ ብሎ ብዙ ብር አንዳይወጣ አሁድ ለ ቅዳሴ ስንመጣ አናፈርሰዋለን!!! ሁሉን በጊዜው የሚስራ እግዚኣብሔር ይመስገን። ኣባቶቼ እግዚኣብሔር የማስፈጸሚያውን ሃይል ይስtachehu. ውሳኔው ይፈጸም!! አንቺ ቤተ ክርስቲያን ሆይ ትንሣኤሽን ልናይ ይሆን? ትንሣኤሽ የእኛ ትንሣኤ ነውና እውነት ያርገው ! ያጽናው! This is really a great job of our Holy Father Almighty GOD! Thank you God that performs this things. Now I am realizing that God is with us. Dear fathers of Holy synod this is what a true orthosdox christains longed for long.Now this is time for God to do His work. Bless you all! Eeeellllleeeeeeeeeeeeeeeeeeeeeeeeeeeeeeeeeeeeeeeeeeeeeeeeeeeeeeeeeeeeeeeeeeeeeeeeeeeeeeeeeeeeeeeeeeeeeeeeeeeeeeeeeeeeeeeeeeeeeeeeeeeeeeeeeeeeeeeeeeeeeeeeeeeeeeee! do not rash for judgement everybody, we will see. 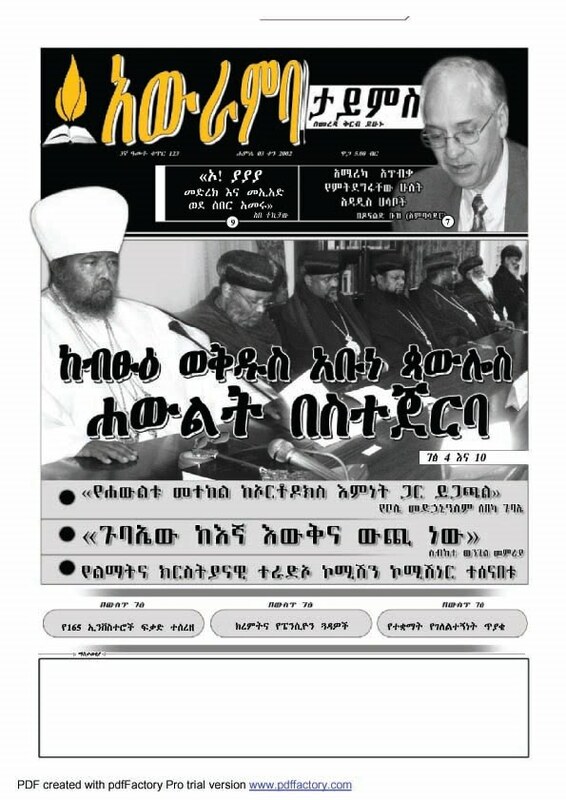 you think ethiopian orthodox church synod back home has power to do this decision? i don't think for me it looks like theory . Tomorrow , you willl see everything is the same.Nothing , Nada. the same abba you saw yesterday, you will see it tomorrow. የቤተ ክርስቲያን ባለ ቤት ከስሕተት ይጠብቀን! Be meman fit endetmereke be meman fit yifres. I like the decision. But it was better if they demolished the erected secular monument at their heart. It was already spiritually demolished before they erect it. I am happy if they remove it from our church compound and installed it somewh...ere in the city as decoration rather than demolishing it totally. It will be used to remember how the existing era Holly Fathers act in the name of God for our next generation. Dani, I consider how your article on "SEW BEKUMU..." has had an impact on their internal selfish monuments. It was sharp from secular point of view (politically) and spiritual sides to make this action. Keep it up Dn. Daneal. However, I couldn't beleive this unless I see it demolished. Why don't we campaign to move it from now on before the Sinodos adjornes the meeting once and for all until next year. GOD REALY HAS TIME TO DO EVERY THING. I CAN'T EXPRESS MY FEELING !! !